A SCHOOLBOY picked to carry the Olympic torch has revealed how he feared protesters would wrestle it from his hands. 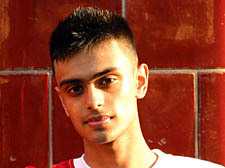 Mohammed Azharul Hussain, 16, from South Camden Community School, was chosen to run between Bloomsbury and Shaftesbury Avenue in Sunday’s relay, taking the torch from former England rugby coach Sir Clive Woodward. Mohammed, who lives in Harrington Square, Camden Town, was told by police to slow down as he ran along Shaftesbury Avenue. The 33-day Olympic Games world relay started in Kalmaty, Kazakhstan, last Wednesday. But, after the embarrassing clashes between protesters and police in Paris and London, the International Olympic Committee is due to have crisis talks tomorrow (Friday) over the future of the event. On one stretch of the London relay, an attempt was made to wrestle the torch from former Blue Peter presenter Konnie Huq.